At this moment, the only headless project I’m considering for using a fixed bridge, is a 30″ baritone guitar. Due to the heavy gauge of the strings this guitar gonna have, using a tremolo is not much wise, also because such tremolo action would result too stiff anyway. 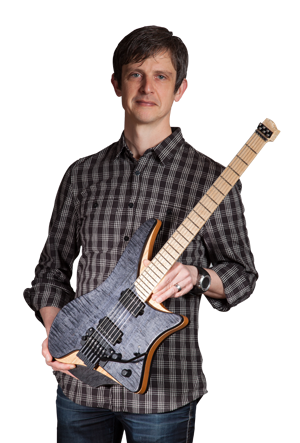 I already have two Bartolini soapbars (P90 dims) for it, also a Headless Research combo headpiece. No body or neck until now but it will be something ergo-shaped somewhere between a Steinberger/Klein although having my own contour of course. I hope to be able to post a picture of the winning contribution in action soon. Thanks again to those who entered, and especially the runner-up Roman. Hands down the coolest idea in Guitars today!